Casio Japan announced the launch of High Speed Exilim EX-FC100/ EX-FS10 compact digital cameras that can continuously take pictures at a speed of 30 shots per second and shoot video at 1,000fps. 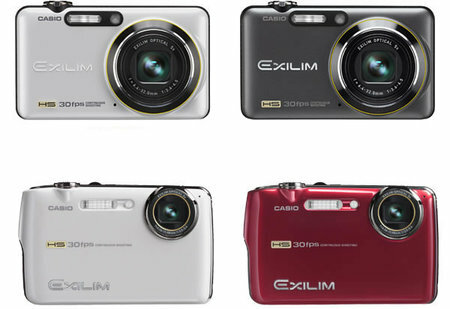 Casio High Speed 9.1 Mpixels Exilim EX-FC100 and High Speed Exilim EX-FS10 have basically same spec except optical and battery life functionality. Model Exilim EX-FC100 with 2.7”TFT LCD comes with 5x optical zoom (37-185mm), while Exilim EX-FS10 with 2.5” TFT LCD comes with 3x internal optical zoom (38-114mm). The battery in the FC100 lasts for approximately 300 shots, while that in the FS10 lasts for approximately 160 shots. While shooting, Slow Motion View allows users to extract still photos from video displayed in slow motion. Furthermore, Casio provided a dedicated button for Slow Motion View in order to improve the operability. The Casio EX-FC100 and the EX-FS10 features a new function called Ichioshi (most recommended) shot. The Casio EX-FC100 weighs 145g and EX-FS10 119g. Both camera with 32MB built in internal memory are compatible with SD/SDHC cards. Both the cameras will be launched in Japan first by Feb end.